If you’ve ever tried to make salad dressing from scratch, you know that one of the biggest challenges is getting the oil and the vinegar to mix properly. No matter how hard you try to shake, stir, or whisk oil and vinegar together, they eventually separate. This happens because vinegar and oil are made of very different types of molecules that are attracted to their own kind. How can we bring together polar and non-polar molecules to make something delicious like mayonnaise (which is essentially a combination of water and oil) or salad dressing? We need an emulsifier. Emulsifiers are the hand-holders of the molecule world. They contain both hydrophobic and hydrophilic regions and are able to attract and “hold hands” with polar and non-polar molecules simultaneously, pulling them together to form a special type of mixture called an emulsion. For instance, after adding an effective emulsifier to oil and vinegar and mixing thoroughly, separation of the oil from the vinegar will take much longer or won’t happen at all. In this experiment, you will test a few common household ingredients to see which is the most effective emulsifier for making salad dressing—and you can eat your results! The dry mustard and vinegar used in this activity can cause respiratory irritation if inhaled. Avoid swallowing, shaking, inhaling, or sniffing these products during the activity. Glass can pose a risk. Clear plastic vials or cups will work for this activity, but they will be much harder to clean and reuse. Unfortunately, if you work in a space or with equipment where non-food safe materials are handled (such as a laboratory), you should not taste your results. Lab tips: For classes, it may be helpful to designate a measuring spoon to each of the emulsifiers or pre-measure individual allotments for each student/group. You may wish to modify this procedure with volumes that are appropriate for the lab equipment you use. Print out the lab protocol and materials list for use in a lab with test tubes, pipettes, and a scale. In a clean kitchen space used only for food safe materials, set out four small, clean glasses with clear sides on a stable work area. To each of three glasses, add ½ tsp of an emulsifier to be tested, putting a different emulsifier in each glass. Label each glass with the emulsifier that was added, and label the empty glass “control.” Label the data sheet with the emulsifiers you will be testing. To each glass, add four tablespoons of vinegar, and swirl to fully mix in the emulsifier. To each glass, add four tablespoons of oil. Take a moment to observe the layers of oil and vinegar as they avoid mixing with one another. This is what separation looks like, a process you’ll need to be familiar with in order to collect data in the next step. Using a fork or a whisk, vigorously stir, whisk, or whip the oil and vinegar in the “control” glass for 30 seconds (time it with a clock or stopwatch). At the end of 30 seconds, start the stopwatch and watch the sides of the glass for 1-5 minutes for signs of separation. When you see that most of the oil has separated from the vinegar, stop the stopwatch and record how long the process took on your data sheet. Repeat step 5 for each of the glasses containing an emulsifier, rinsing off and drying the whisk after each mixing. If an emulsion has not separated after 5 minutes, write “over five minutes” and the time of day on your data sheet. Did the mixtures with the emulsifiers take more or less time to separate than your control? Is this what you expected? Based on your observations of separation time, which emulsifier would you recommend using for making salad dressing? How would you expect the separation time to change if you added more emulsifier? Why? What about if you added more oil than water? Lemon juice is mostly citric acid and water. Would you expect it to mix better with olive oil or vinegar? Why or why not? Look for recipes for other salad dressings or vinaigrettes online. For each, try to identify which ingredient is the polar molecule (hydrophilic), which ingredient is the non-polar molecule (hydrophobic), and which ingredient is the emulsifier. Listen to our interview with culinary scientist Ali Bouzari (excerpt below) to hear how food science can help you make your favorite condiments, then read his SciFri article "Secrets of the Sauce" to learn more about the science of edible liquids. You can also print the article for classroom use. Watch this video of a chef using food science to help craft a new version of a classic emulsion: hollandaise sauce. 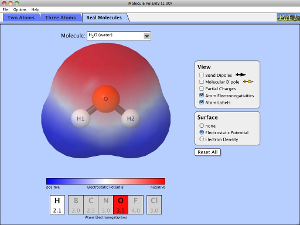 Deepen your understanding of polar molecules by trying this interactive from PhET Interactive Simulations. NGSS DCI PS1-A: Each pure substance has characteristic physical and chemical properties (for any bulk quantity under given conditions) that can be used to identify it.